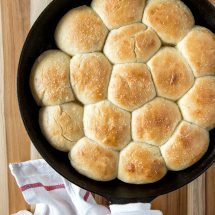 These one hour dinner rolls are soft and fluffy, and really do take only about an hour from start to finish, including rising time. They are the perfect compliment to any meal. I have always been really nervous to work with yeast dough because it seems so delicate and difficult to work with. But I love bread. I knew that eventually I would need to come to terms with my fears and this was the perfect recipe! Since getting my Kitchen Aid Mixer, that dough hook attachment has been calling to me. I’ve seriously never used it in the two years I’ve had the mixer! 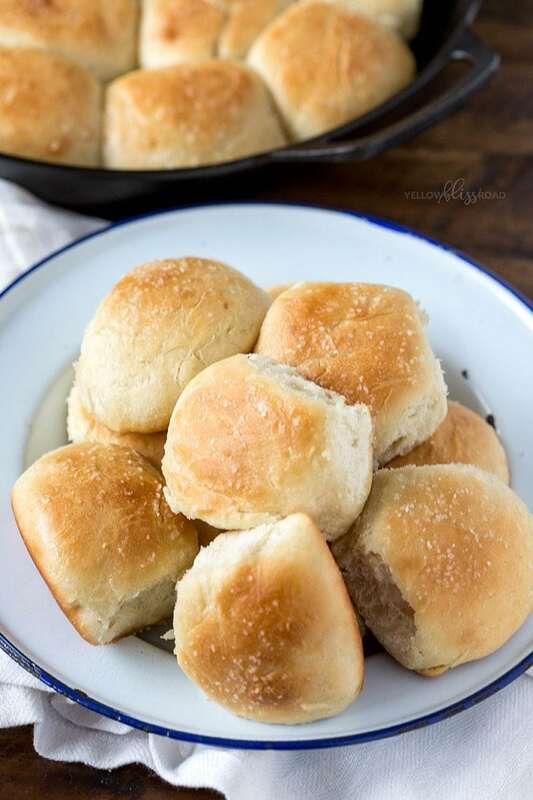 I’m participating in a recipe swap and today I’m sharing this One Hour Dinner Roll recipe from my friend Alicia at The Baker Upstairs. It was the perfect opportunity to break out the dough hook attachment. The humidity and air temperature (hot, dry day versus a cold and rainy day) can cause difference in the absorption of flour, and can also drastically affect the dough’s ability to rise. I was baking on a cold and rainy day, so I needed more flour, and the rising took a little bit longer than it would have on a hot and dry day. It still works, you just may need to adjust the recipe slightly based on your location and the weather. 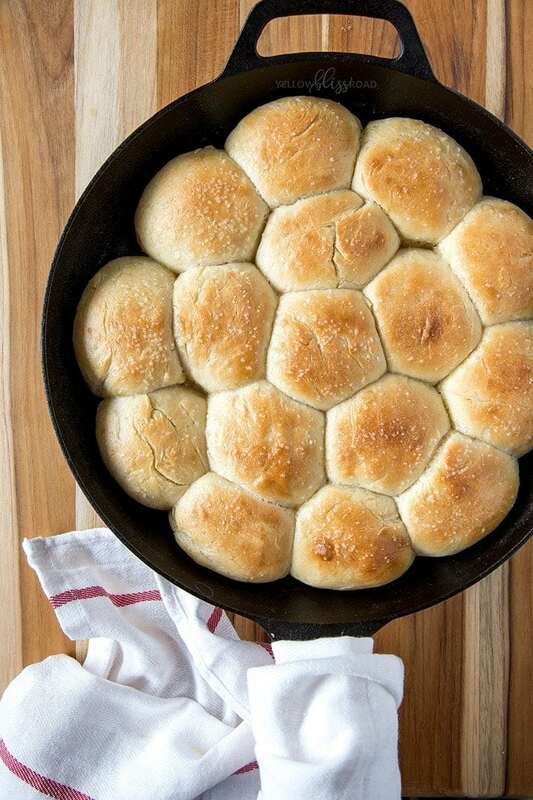 WE LOVED THESE SOFT AND FLUFFY DINNER ROLLS! Nearly half of the rolls were gone even before dinner time…and there are only a few left now. 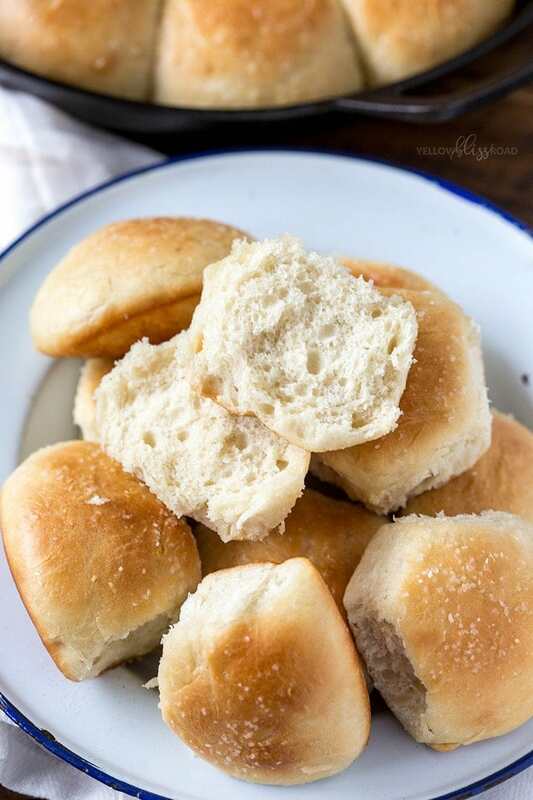 If you’re a scaredy cat like I was, I think you should give this homemade dinner roll recipe a try. You’ll be amazed at how good and easy it is! Stand Mixer – This baby is the workhorse of my kitchen and makes bread making a breeze. Cast Iron Skillet – With a multitude of uses, a cast iron skillet is a great addition to your kitchen. It bakes and cooks evenly and requires minimal effort for upkeep. It also lasts forever! 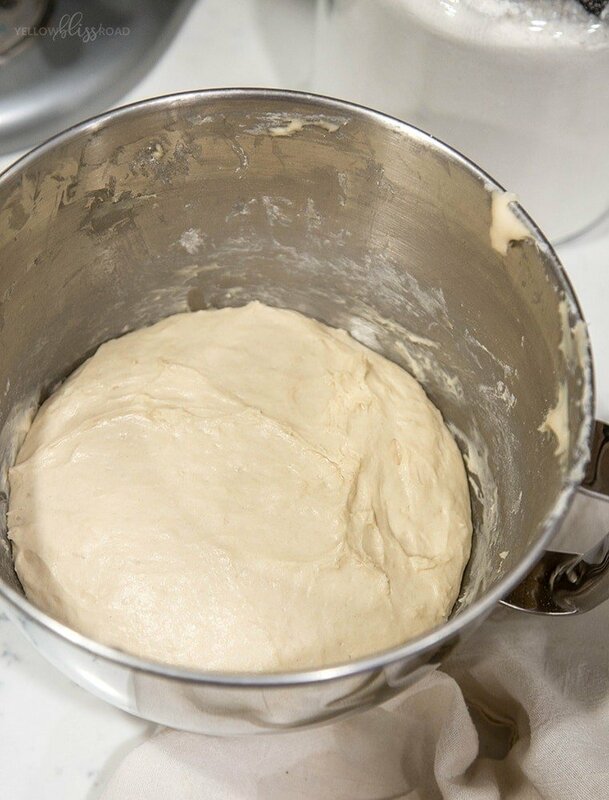 In a large bowl or the bowl of a stand mixer with a dough hook attachment, dissolve the yeast and sugar in the warm water and let stand for five minutes, or until foamy. Add butter, salt, and 3 cups of flour. Mix until combined. Add additional flour, 1/4 cup at a time, until the dough pulls away from the sides of the bowl and is only slightly sticky to the touch (careful not to add too much flour!). Knead the dough 3-5 minutes, until smooth. Cover with a towel or plastic wrap and let rise for 20 minutes. Preheat the oven to 400 degrees F and line a 9 x 13 pan with parchment paper or spray with nonstick cooking spray. Gently punch the dough down and divide into 20 equal sized pieces. Roll each piece into a ball and space evenly in the prepared pan. Brush with melted butter, sprinkle with sea salt, and let rise for an additional 15-20 minutes. Bake 13-15 minutes, or until golden brown. Remove from the oven and brush with more melted butter. Can you make these the day before? 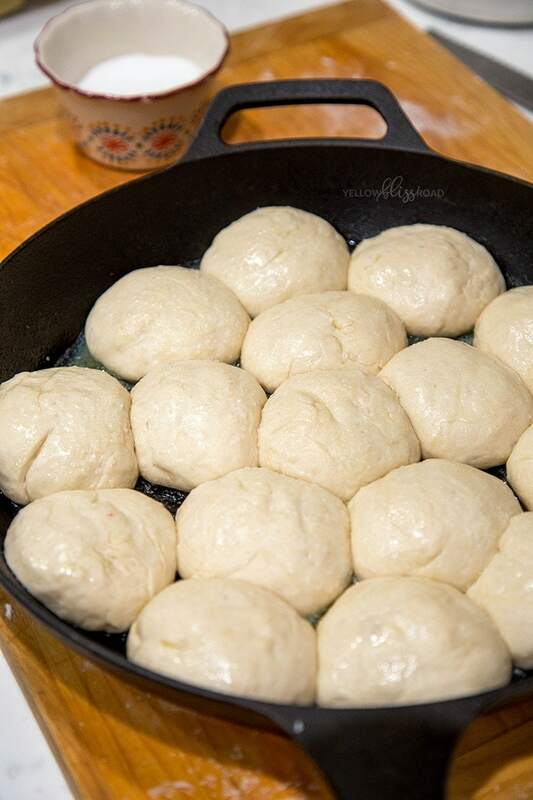 Would you shape them first or just refrigerate the bowl of unformed dough? You could bake them and reheat them, but because they need the rising time, they couldn’t be prepped beforehand. You do not say if the flour you used was self rising or not?? The rolls look delicious and I want to try them and not use the wrong flour. Hi Teresa, Typially if a recipe calls for self rising flour it will be noted in the recipe. This recipe uses all purpose flour. They look fantastic Kristin! Thanks for sharing my recipe. I definitely need to try them in a cast iron pan!